Today, Disney released a preview of the upcoming Minnie Mouse Mickey’s Not-So-Scary Halloween Party card. The card is the 7th special card to be releases since the game debuted at the Magic Kingdom in 2012. Below is a look at the new card, plus details about how to obtain this new and exclusive card. When Mickey’s Not-So-Scary Halloween Party returns for another season of fun at Magic Kingdom Park September 15, guests can pick up an added “treat” – this event exclusive Sorcerers of the Magic Kingdom. In case you’re new to Sorcerers of the Magic Kingdom, SOTMK is an in-park interactive experience that allows guests to team up with Merlin in a quest to defeat Disney villains who are attempting to takeover the park. Guests use special maps to search for villain hideouts throughout the park. When they find one, guests use different spell cards to battle the villains. Guests can begin their quest at the Firehouse on Main Street, U.S.A., and the game (and starter packs) are complimentary with park admission. 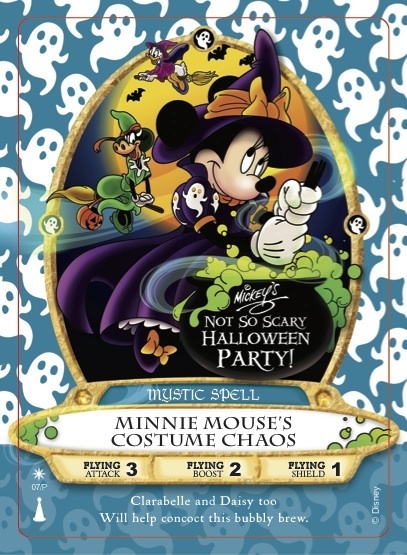 This year’s “Minnie Mouse’s Costume Chaos” card features Minnie, and friends Clarabelle Cow and Daisy Duck, dressed as witches. This event-exclusive card will be distributed in addition to the regular SOTMK card packs (meaning you can pick up both while attending the party). Guests must show their party ticket and event wristband in order to get one.